The meat-focused Japanese-influenced restaurant in Wallingford has a bare-bones feel, with food that exceeds expectations. Kokkaku means “skeleton” in Japanese, and there is indeed something of a bare-bones aura about this meat-focused, Japanese-influenced Wallingford restaurant. Passers-by peering in from the sidewalk during the dark of winter may find little to entice them inside. True, the softly lit interior has a warm, whiskey-hued patina, but the white walls are devoid of decoration. The bar is tucked deep within the long, narrow space; the kitchen is seen in a silvery glow at its farthest end. No menu is posted in the windows, but even if so, it’s enigmatic in the extreme. 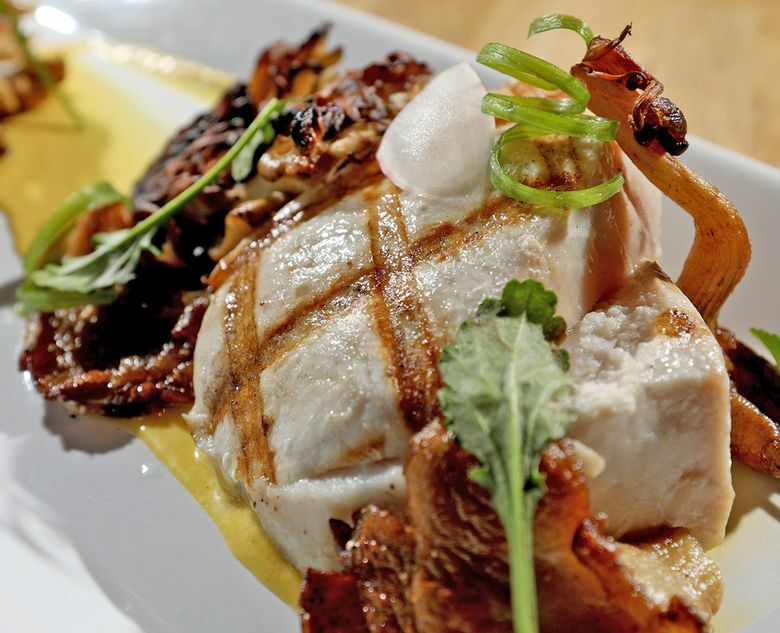 The menu gives no hint of how the Mad Hatcher half chicken or the Hawaiian swordfish or any of the “Butcher Block” beef is prepared. 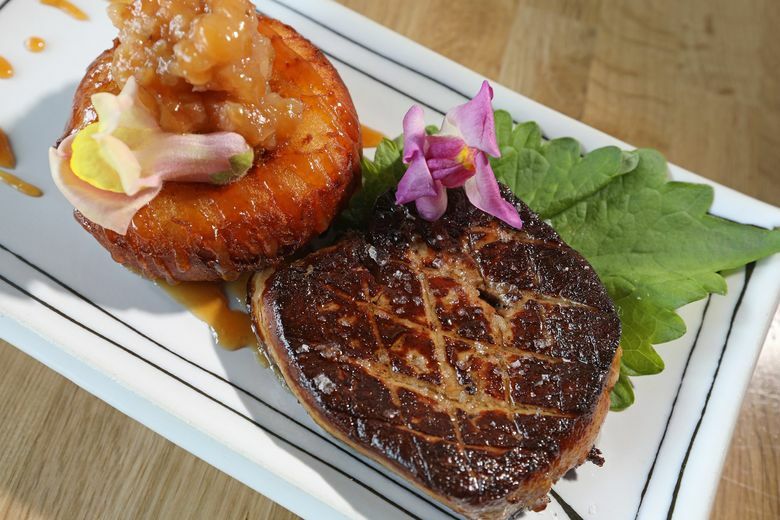 There’s no clue that a superb sweet potato doughnut and roasted apple compote accompanies the seared slices of Hudson Valley foie gras; no tipoff that the matcha éclair comes with duck-fat ice cream (which is, frankly, the only reason to order the éclair). After venturing inside a few times, I found Kokkaku a strange and wondrous experience. Strange because the restaurant was nearly empty every time, which always creates an uneasy dynamic. Wondrous because the food often exceeded expectations. Hours: dinner 5-10 p.m. Wednesday-Monday (closed Tuesday); happy hour 5-6 p.m. and 9-10 p.m. So, allow me to, ahem, flesh things out a little. Wagyu beef is central to the menu. It turns up as tartare, coarsely ground and finished with wasabi oil and sesame seeds, with a swipe of custard-like egg yolk for extra richness and fried pork rinds dusted with yuzukosho for scooping it all up. The “Butcher Block” section of the menu showcases different cuts of Mishima Reserve wagyu priced by the ounce ($5-$6 per ounce with a 2-ounce minimum). Kagoshima Kuroge A5 Japanese wagyu, a newcomer to the menu, requires a minimum order of 4 ounces at $18 per ounce. The Mishima Reserve flap, zabuton and chuck skirt I sampled were seared very rare, salted, sliced and fanned out on a plate, with radish rounds, minced daikon and some microgreens as the sole accompaniments. The presentation has the advantage of showing off the wagyu’s rich marbling. Barely warm to begin with, the meat rapidly cools to room temperature, which intensifies its flavor. It’s like caviar for a certain type of carnivore. 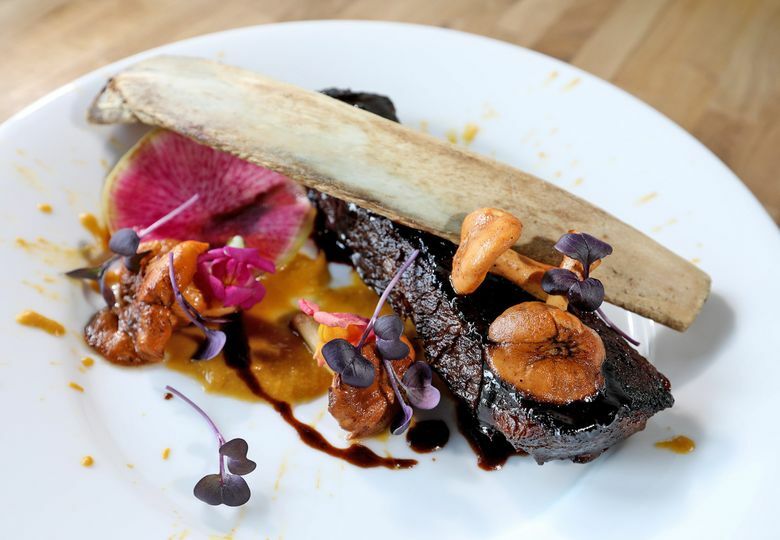 If you like your beef hot, crusty and daubed with demi-glace, order the Painted Hills beef rib bone. The tremendously supple, miso-braised meat gets finished on the grill, which caramelizes the fatty edges. Sliced off the bone and scattered with orchid petals, it’s a primal experience rendered with elegance. There is more to enjoy beyond beef. The swordfish was outstanding. Briefly salt cured and grilled until just opaque, it was served over velvet-textured turnip purée with beet dashi and sautéed matsutake and nameko mushrooms. Duck breast, shoyu-brined for 24 hours and dry-aged for a week, had an appealing ham-like texture and thin, crisp skin. 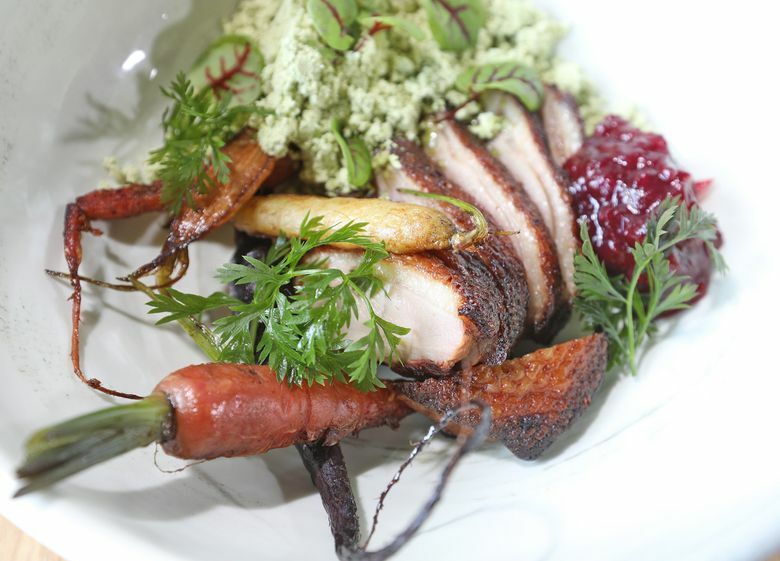 Cranberry relish and roasted carrots enhanced the duck; green drifts of oily-tasting matcha powder did not. The excellent chicken turns out to be braised, flash fried and served in a shallow pool of chicken-mushroom-dashi broth that was as compelling, in its quiet way, as the porky, sake-spiked broth for tiny Dabob Bay Manila clams with pig ears. Those crunchy shards are like cracklings that result from braising the ears, removing the cartilage, then air drying, compressing and frying the skin. Kokkaku opened in July, but all my visits were in November and December, after Dylan Herrick replaced opening chef Rudy Velasquez, who is now executive chef at Carnivore in Ballard. Both chefs cooked at different times at Miller’s Guild, where their paths crossed with Julie Shizukuishi, who was general manager. She’s the self-styled “boss lady” here, too, as well as a sake expert, able and willing to guide diners through Kokkaku’s small but intriguing list. Herrick was most recently cooking for Microsoft/Compass Group. He began tweaking Kokkaku’s menu from his first day. In addition to broadening the protein choices, he has expanded side dishes to include more vegetables. Happily he’s kept the beef-fat roasted potatoes. He’s added root vegetables braised in chicken stock that are a little bland, despite a blanket of bonito flakes. For those craving something green, I recommend garlicky sautéed mustard greens, long beans with soy and ginger, and especially what the menu mystifyingly refers to as “yuzu vin greens with tamago curds.” It is a vibrant, citrus-dressed salad of pungent greens, pickled beets and chopped pickled wasabi stems to which the tamago — made of egg whites, buttermilk and miso whisked into boiling water to form “curds” — imparts a nice textural contrast. I came away from every pleasant evening at Kokkaku wondering why it wasn’t busier. Then I totaled my receipts. Even if you don’t get carried away with sake or cocktails, or overdose on A5, it’s not a cheap ticket. But hey, big spenders, I know you’re out there. Kokkaku is throwing a bone to the carnivores among you.